As the families of Gilad Shaar, Naftali Frenkel, and Eyal Yifrach languish in uncertainty, grieving the alleged kidnapping of their three young boys, the world watches on as their anguish is politically co-opted to provide a veil of destabilization of indiscriminate military force to the Palestinian communities in the West Bank, Gaza, and Israel. The mobilization of Israeli and International news outlets providing up-to-the-minute analysis on the trajectory of the investigation of the kidnappings – capturing moments of national heartache of the kidnappings of three young Jewish boys, coupled with emerging social media campaigns have heighten the sense of urgency, and provided a socio-political environment for Prime Minister Benjamin Netanyahu to advance the right-wing agenda. Netanyahu and his ilk have hijacked the legitimate, raw emotional pain of the kidnapping catastrophe and transformed it into the political impetus to section off Hebron from the rest of the world, target the Palestinian unity government, deploy intimidation and systematic abuse as a measurement of collective punishment as a means to strategically empower the Zionist settler enterprise in the West Bank, Hebron specifically. A cursory glance at the movements of the Israeli forces, the rhetoric of Israel’s security apparatus, and the political posturing by Netanyahu in light of the realities on the ground around Hebron demonstrate that there is parallel operation being conducted alongside the search for the three boys. This past Thursday, according to documents published on Sunday, one of the abducted teens was able to contact emergency services after he was taken, at 10:25 P.M. on Thursday, reporting that, “We’ve been kidnapped”, according to Haaretz. After a delayed response to the emergency call by emergency services, the Israeli Defense Forces have shut down all but two access points to the district of Hebron, one through the Halhul area in the north, and the Yatta entrance in the south. The lapse in response time beckons the question on the utility of saturating Hebron with a massive military presence, in an area that is already under severe Israeli military oppression and surrounded by illegal Israeli settlements. Security officials have doubts that in the event of a kidnapping that the kidnappers would have retreated back to an area where not only the Israel military has a heavy presence, but also an area that the Palestinian Authority has a long history of working collaboratively with the IDF on security issues and the execution of military directives. The kidnappers would have to negotiate their plan around the thousands of Israeli soldiers, the private security forces and technologies around the settlements; not to mention, the prospects of violent vigilante retributions from the Jewish settler population around Hebron (cases have already been reported of Palestinians suffering from attacks in the area around the Kiryat Arba settlement, the hill side of the Tel Rumeida settlement and the Sushiya settlement), as well as hide their locations and plans from the Palestinian Authority intelligence regime and Palestinian collaborators. There is a strong possibility that if the young men were to still alive, they would have been transferred south to Egypt or east to Jordan, rather than try to hide out in the highly militarized area of Hebron. Yet, Hebron is where the bulk of the incursions are taking place. The IDF has arrested over one hundred Palestinians in and around the area of Hebron, mostly those with loose connections, and some no verifiable connection to Hamas. Hamas has been branded as public enemy number one, and this rigid paradigm for seeking out suspects in the alleged kidnapping is very problematic. Hamas is a political movement that many people subscribe to because of their social and religious views, not necessarily because they have a special affinity towards violence or retribution. Furthermore, many more Palestinians drift that way on the political spectrum as a vote against Fatah, rather than a vote for Hamas because of the systematic corruption of Fatah and the historical ineptitude for providing basic services in the West Bank and Gaza. This tactic for assigning every potential Hamas affiliate with a suspect status has bared its own fruits and at the same time, exposed that it’s a strategy of indiscriminate collective punishment rather than an instrument for precise data collection to avoid harassment of the local population. In a kidnapping case of three individuals, it would be hard to believe and a historical anomaly that each of the hundred plus individuals jailed, detained, or arrested since the reported kidnapping had any knowledge of the incident. 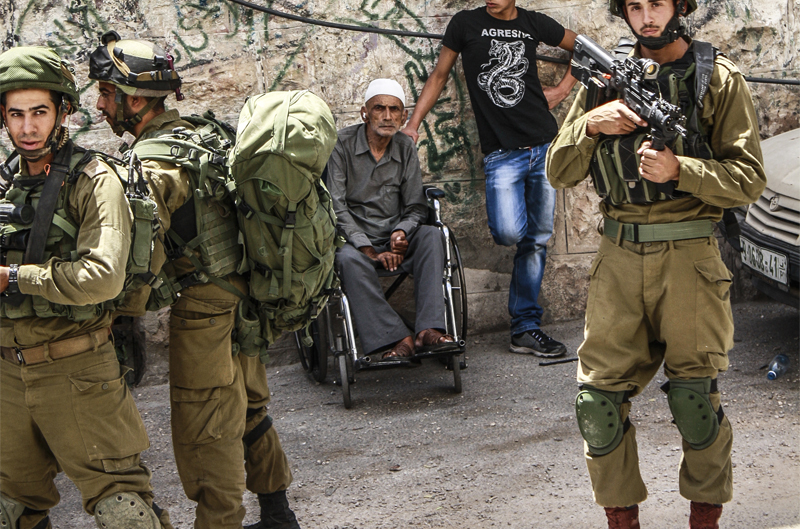 The arrests are a function of using this instigation as a political proxy war weapon, targeting Palestinians because of their suspected political leanings; rather than any meaningful connection to the kidnapping. This is common sense: individuals or groups preparing to execute a kidnapping generally do not inform hundreds of families of their mission, particularly in a society where such sensitive information can be used as a currency for Israel’s military forces to obtain building permits for homes, permission to work or visit inside of Israel proper, or other economic incentives. The IDF understands this social dynamic and the disharmony between locals because it has manufactured the system of communal exploitation with their intelligent services. An additional, although not convincing, bit of evidence that Hamas as a political institution is not connected, is the claim that the Islamic State of Iraq and Syria (ISIS) had a hand in the kidnapping, as a pamphlet with the ISIS insignia was found in the West Bank claiming responsibility for the crime. Claiming responsibility for attacks is used as a political commodity to attracting and legitimizing the actions of rogue groups by demonstrating missions of success. Historically, when Hamas has acted with violence towards Israel’s political regime, they have acknowledged and claimed responsibility to bolster their position as the figure-head of the Palestinian liberation movement. Hamas has not, as of yet, claimed responsibility for the kidnapping; raising doubt whether they played a hand in orchestrating and facilitating the crime. If this strategy was designed to extract information, there would be more traction on the ground, and with so many career politicians’ jobs and reputations hanging in the balance, and the Israeli public licking their chops to hang the misgivings of the kidnappings on somebody, it would make sense that some information on the suspects, or connections to the where about of the victims was to surface – the politico would be trumpeting the success to advance their position in the public arena. This has yet to happen. This political blame-shifting and necessity to give the investigation direction definitely played a role designating Hamas as the culprit. For the Knesset to be able to flex its will in the Occupied Territories and expand settlements, it’s crucial that public opinion bases it’s decisions on a paradigm of security. Branding Hamas as a terrorist organization is the only legitimate way to carry out that rhetoric on both the national and international stage. The public so far knows very little outside of the alleged time of the kidnapping. But what we do know is the absolute mayhem that the additional troops and military mandates, carried out by the IDF, has taken a heavy toll on the health and well-being of the Hebron district, particularly on innocent families. The routine night raids, day patrols, confiscation of public property for military outposts, and the blockades on all but two access points into Hebron has suffocated the livelihood of Hebronites and created a tense environment. Soldiers raided the home and took up position of the Al Awewy family home in Aqbet Taffuh for six hours on Sunday. Over 50 troops had occupied the home while three adults, four young girls and a young boy were in the home. One of the young girls in the house, just a little over a year old, was forbidden to leave by the Israeli military, and a mother had to sit helplessly wondering about the safety of her daughter and her health, having been without her mother’s milk for several hours. No suspects connected to the kidnapping were found in the home. In that same area on Monday morning, the IDF confiscated the security camera equipment and footage of the Al Natshe family home. Around 7:00 a.m., seven military jeeps surrounded the apartment complex; home to several Palestinian families and took the private property. Further down the road in the Taffuh area, approximately 55 Israeli soldiers left the hill top area of the Palestinian municipality, occupied several homes, questioned families, tore down a private Palestinian fence and occupied the neighborhood for several hours. Throughout the afternoon, north east of Bab Al Zaweyah, just outside of the H1/H2 intersection, a brigade of over 40 soldiers, separated in separate units stationed themselves in four different homes and a supermarket with in a two hour period, leaving families frightened and unsure of their intentions. Christian Peacemaker Teams (CPT) didn’t witness any arrests during this period, but rather a series of tactical displays of power as the Israeli forces established a physical presence in key sections of Hebron. The routine physical raids on homes have the very real potential for physical injury on the inhabitants. On June 15th at around 9:30 p.m., an Israeli raid on a Palestinian home ended with a seven year old Palestinian boy severally injured and in the Ein Kerem hospital in Jerusalem. The IDF used an explosive device to dislodge the front door of the Akram Al Qwasmeh home. The subsequent powerful blast shattered the tempered reinforced glass, shearing the decorative steel lash and sending pieces of shrapnel into all corners of the home. The dramatic and unnecessary use of explosive devices in a confined area shredded and severally injured Akram Al Qwasmeh’s son. After the explosion, Akram Al Qwasmeh wasn’t allowed to see his son, and according to reports, the military initially stopped medical personal from treating the victim. The explosion happened around 10:30 p.m., and according to locals, the IDF kept a presence in the area until 4:00 a.m.
CPT arrived the following day and found a home completely turned up-side down. Children’s belongings were spread and broken around the house, Israeli soldiers demolished the kitchen, smashing fruits, vegetables, and other food items on the floor, and in a bizarre twist of occupying a Palestinian home there was feces on a rug in the basement. These are just a few of the incidents that CPT are able to directly report on. Other human rights organizations have also reported settler violence in the area of Tel Rumeida and Kiryat Arba. The increased Palestinian restrictions and national sentiment has sparked additional settler activity in the areas stretching from the south east to Kiryat Arba to the north western corner of Tel Rumeida. The settler belt of Hebron has witnessed increased vehicle and foot traffic, aggressive behavior towards international workers and has led to violence against Palestinians. Historically, Palestinian violence has been the justification for settlement expansion in Hebron. Currently, the Hebron Rehabilitation Committee has identified over 22 locations of pending settlement expansion and settler activity. With the international community taking strategic steps to enforce international law, civic, religious and academic institutions taking part in the boycott, sanction, and divestment (BDS) campaign, along with the Palestinian government gaining new access to international legal instruments, there is pressure on Israel’s settlement project to create facts on the ground. These dynamics all together, suggest that the individuals investigating the case of the three young kidnapped boys realize the political opportunity and have decided to mobilize while the international community is distracted.